DETAILS: Do you often wonder why you are getting so distracted and forgetful? If you want to have fun while learning more about your memory, this is an interactive program you don't want to miss! No charge for the program. Please register at 217-732-2189. For more information, ask for Marcia Cook. Refreshments available. WHERE: The Christian Village Senior Apartments, 1500 Seventh St. DETAILS: Topic: "Raising Responsible Kids." Presenter: Patti Faughn. Free workshop with preregistration required. To register, call Community Child Care Connection at 1-800-676-2805, ext. 8225. WHERE: 2018 N. Kickapoo St. DETAILS: Muzzleloader trap shoot, old-time firearm trap shoot, modern firearm trap shoot. 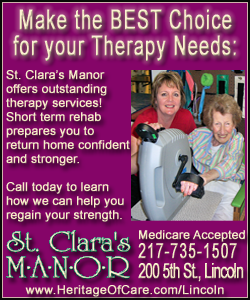 For more information, call 217-735-3212. DETAILS: Stories, movement, crafts. Registration is required for accurate planning. Call Youth Services Department, 732-5732. DETAILS: Topic: "Getting the Bully by the Horns." Presenter: Jade Utsler. Free workshop with preregistration required. To register, call Community Child Care Connection at 1-800-676-2805, ext. 8225. DETAILS: In partnership with the Smithsonian, the Lincoln Heritage Museum will offer special events for “Museum Day.” Rare Lincoln artifacts and “The Town is Yours,” an exhibit of historic photos of the city of Lincoln, will be on display. A children’s activity room will have games, activities and crafts for younger visitors. As guests enjoy the museum, they can sample Mary Lincoln's white almond cake. Each visitor will receive a small attendance gift for attending the event. WHERE: Lincoln Heritage Museum, 300 Keokuk St.